Looking back over 20 years of digital advertising, display ads are remarkably the same. Ad sizes are relatively the same, and we still have banners with moving parts – scrolling, expanding, etc. There have been more regulations, Google is clamping down on flash ads and interstitials, IAB with standards on sizing, weight, viewability, etc. 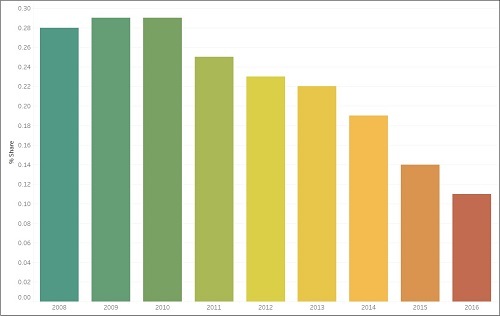 But the most significant change over the past ten years is that display advertising is in serious decline. All of the above statistics are in relation to the digital advertising industry as a whole. We must ask, how is the pharmaceutical industry bearing this shift? According to an article in Pharmaceutical Commerce, in 2016, healthcare and pharma digital had a 20% gain over other forms of advertising (like TV and print). Digital moved to over $2 billion, still pharma is only a small portion (2.8%) of total digital ad spend over all industries. eMarketer is forecasting a 15% growth in pharma digital spend into 2020.4 However, in what formats are these digital marketing dollars moving to? Due to regulatory compliance, in terms of digital advertising, pharma has been traditionally heavy on display advertising, where the standards are clear and there is more space to discuss adverse side effects. Furthermore, pharma has concerns because Google and Facebook keep their data under lock and key otherwise known as “walled gardens.” Programmatic is in the same boat, lacking both transparency and vital data. Consequently, if pharma is not pushing their dollars to the Google-Facebook duopoly, then where are those dollars going? Pharmaceutical Commerce predicts that pharma may “find greater success targeting physicians directly through digital channels.”4 What this means is identifying the physicians that are visiting healthcare websites in order to display timely, targeted ads to that specific physician. “Prescriber Authentication” is the process by which physicians, and other HCP’s with the power to prescribe, are verified or authenticated. Once authenticated, they may be served specific display ads upon future visits to the site, depending on their specialty or areas of interest. In Q4 2017, 85% of the proposals that went out to advertisers from eHealthcare Solutions (EHS) had some form of authenticated advertising in them. Furthermore, in a recent advertiser survey, performed by EHS, 64% of advertisers chose “List-match targeting to authenticated prescriber” as the most important targeting feature. Advertisers in pharma no longer just want impressions on specialty sites, they want to know who they are impressing and the majority have specific prescribers that they want to reach. In this way, pharma can stick with the traditional banner formats that they are familiar with and adhere to regulatory compliance. At the same time, they can get more out of their marketing dollars by knowing exactly who they are reaching.